it's Melba at any prices! A company of old monkeys. every time a new adventure. 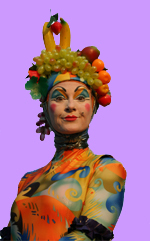 You are on Melba & Compagnie website, street shows, dance and comedy in stilts. You will find all kind of information on our shows, our partners and the life of the company! You can come back because it will always be in evolution. Some photos hide surprises, have fun! Now, we have in our drawers 15 pairs of beautiful stilts for initiation, training and coaching and The Color's are finally equipped with LED as Bazartouka (see Colorissimo) for night performance. We have a new show named "La Belle Poule" and "Les Fées d'Hiver" have changed their wardrobe. Have a good visit in this website, we hope you'll find what you are looking for.